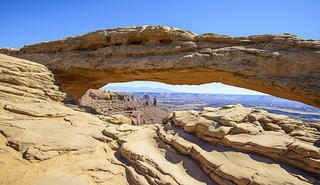 A sandstone arch at Canyonlands National Park. If you’ve read the spring 2017 issue of Preservation magazine, you know that Bears Ears, a 1.35-million-acre site in southeastern Utah, was designated as a national monument by President Obama in December of 2016. Despite the controversial nature of the designation and the monument’s uncertain future under the new administration, we thought we would take this opportunity to highlight a few more of the incredible National Park Service sites that this region has to offer. If you like otherworldly rock formations and desert floors that look like moonscapes, southeastern Utah (and parts of nearby Colorado) are for you. The National Park Service websites for each location offer information about accessibility, peak visitation times, and anything else you need to know to tackle some of the most stunning landscapes that America has to offer. Lace up your hiking shoes, and don't forget to bring plenty of water. Author Edward Abbey counted Canyonlands National Park among his favorite places, describing it as “the most weird, wonderful, magical place on earth—there’s nothing else like it anywhere” in his book Postcards from Ed: Dispatches and Salvos from an American Iconoclast. Located north of Bears Ears, there are any number of "weird, wonderful, magical" landmarks to explore at Canyonlands. The Island in the Sky mesa rises over 1,000 feet over the surrounding terrain, and is the easiest area of the park to visit if you’re short on time. The Needles, a group of sandstone spires in the southeast corner of Canyonlands, are accessible via hiking trails. Adding to the grandeur are life-sized Native American rock paintings in Horseshoe Canyon, accessible by dirt roads and hiking trails, and whitewater rapids in Cataract Canyon, accessible by hiking trails (and whitewater rafts, if you’re holding an NPS-sanctioned river permit and feeling particularly adventurous). Arches National Park is home to over 2,000 natural sandstone arches. Billed as a “red rock wonderland” by the National Park Service, the aptly named Arches National Park is home to over 2,000 natural sandstone arches, the highest density of natural arches in the world. The entire park sits on top of an underground salt bed, whose prehistoric shifting and repositioning contributed to the development of the aboveground rock formations. Some of the most iconic and recognizable of these are Balanced Rock, the Delicate Arch, the Devil’s Garden, the Fiery Furnace, and the Three Gossips. As one of the most popular sites in the National Park System, Arches receives more than 1.4 million visitors each year, and roads and parking lots can get congested during the peak months, between March and October. NPS suggests visiting before 8 a.m. or after 3 p.m., if at all possible, to avoid crowds. Fun fact: At 1.9 million acres, the Grand Staircase-Escalante National Monument is slightly larger in area than the state of Delaware, making it the largest national monument in the U.S. Like Bears Ears, its designation was controversial. 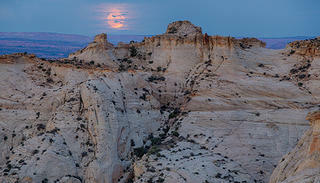 President Bill Clinton used his power through the Antiquities Act to name Grand Staircase-Escalante a National Monument in 1996, prompting local officials and a Utah congressman to question whether the Antiquities Act allowed such a vast area of land to be protected. Subsequent lawsuits were dismissed by federal courts, and the monument, under the purview of the Bureau of Land Management, remains intact to this day for visitors to enjoy. The “Grand Staircase” is a series of plateaus that descend south, from Bryce Canyon toward the Grand Canyon. You’ll find the highest part of the monument at Kaiparowits Plateau, 9,000 feet above the surrounding landscape. Visitor centers are located in Cannonville, Big Water, Escalante, and Kanab. Canyons of the Ancients National Monument. 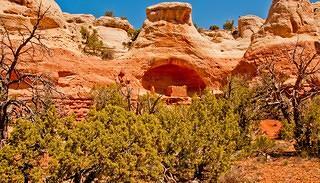 Located in southwestern Colorado near the Utah border, Canyons of the Ancients National Monument was originally established in 2000 to preserve the largest concentration of archaeological sites in the U.S., most of which are Ancestral Puebloan ruins. While at least 6,000 distinct structures have been identified in the monument, some of the most distinctive are the Lowry Pueblo (the only developed recreation site within the monument,) the Painted Hand Pueblo, the Sand Canyon Pueblo, and the Kiva ruins. Other man-made elements scattered throughout the monument’s 176,056-acre expanse are stone towers, which may have been lookouts or sentry posts; sweat lodges; shrines; and petroglyphs. Individual canyons are accessible from various points along the Trail of the Ancients National Scenic Byway. Access points in Colorado include Dove Creek, Cortez, Dove Creek, Cahone, Pleasant View and Yellow Jacket, while Bluff, Blanding, Montezuma Creek and Anetha are all access points in Utah. The Quarry Exhibit Hall at Dinosaur National Monument. Aside from checking out the remains of dinosaurs like Allosaurus, Abydosaurus and Deinonychus, there are plenty of places to explore within the 210,844-acre Dinosaur National Monument, including Echo Park, where the Green and Yampa Rivers converge; Whispering Cave, a narrow cut in the sandstone of the landscape; and the Pool Creek Petroglyphs.